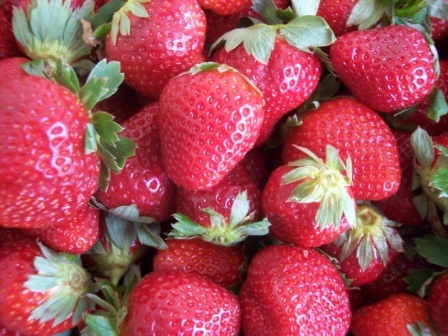 Most people who grow strawberries – or who pick-them at pick-your-own operations or even frequent Farmers’ market – are familiar with the so-called June strawberries. They bear over a few weeks from mid/late May to mid/late June here in the Northern Piedmont depending on the cultivar. For the kitchen gardener, that’s good only if you have time to process lots of strawberries then. I don’t know about you, but in May and June, I am always so behind with planting and new garden projects that should have been done 3 months earlier (and really can’t wait any longer) that I really don’t want to deal with 40 quarts of strawberries. So last year, I got ‘Tristar’, a day-neutral strawberry developed at the University of Maryland. While the June strawberry flowering (and therefore fruiting) is trigged by a certain amount of day light, day neutral strawberries don’t give a fig and flowers as long as there is no frost. I get fruit from early June until frost. Last year, I threw agricultural fabric over the bed, and I actually got a few strawberries for Thanksgiving. I can’t say they were very tasty but it was a victory of sorts… Best of all, you can harvest the year you plant. You have to pinch the flowers through June after which you let the plant flower. Unlike the June bearer, the crop is spread over many months. From 25 plants, last year I got over quart a week. This year, I got a quart or two every other day for about 3 weeks. Then there was a lull for a couple of weeks, and I can see I’ll be able to start picking again in few days. Based on a recipe from “Dessert Sensations Fresh From France” by Faye Levy. 1 large bunch of mint, any “flavor”, roughly chopped. I like plain spearmint or peppermint; chocolate mint is nice too. In a heavy-bottom sauce pan (with a lid), mix sugar & water and stir until sugar is dissolved. Bring to boil; boil for 30 seconds; add the mint; turn off the heat, cover and let steep for at least 30 minutes, up to 2 hours. Strain syrup into a bowl through a sieve, pressing on the mint with the back of a spoon to extract all possible flavors. Chill thoroughly, either using ice-bath or overnight in the fridge. Wash and hull strawberries, and puree into blender with a little lemon juice (1 T) and the vodka until smooth. Strain through a fine sieve, careful to collect all the accumulated juices on the underside of the sieve. Add 1 ¼ cup cold mint syrup. Stir thoroughly and taste. It should taste slightly over sweet, add a few T syrupy or lemon juice as needed. Make sure the mixture is thoroughly cold before adding it to the ice-cream maker. Process ice-cream maker manufacturer’s instructions. If you do not have an ice-cream maker, pour in a wide freezer-safe container and freeze. Every 20 or 30 minutes, take out of the freezer and mix thoroughly with a fork, breaking the ice-crystals. Return to freezer. Do this until the sorbet is frozen solid. This will be closer to a granite than a sorbet, but still be very good. · You may omit the vodka, but the alcohol freezing at a lower temperature helps keeping the texture of this sorbet less “icy”.